WHY A FLEXIBLE WORKSPACE IS NECESSARY FOR YOUR ORGANIZATION ? 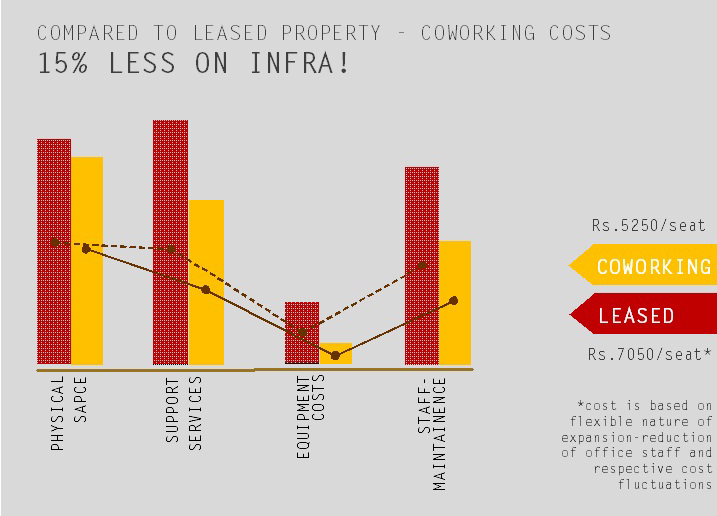 Concept of Coworking is relatively new but is growing at an enormous rate of more than 40% each year. More than 41.6 million sqft of traditional leased office space has been converted to coworking in the last couple of years! The freedom and flexibility that an office space offers plays a great deal in motivating employees and improving their productivity. As a result, large number of companies are now moving their operations to Coworking Spaces. These workspaces are specifically designed to offer a vibrant and a flexible work environment to the people. Technology is constantly changing and increasing the mobility in the way work is being done. By working in a flexible workspace, organizations can cut down on their costs, increase their overall productivity and provide a dynamic work environment for all their employees. Recreational, collaborative and working areas are interwoven to generate an overall dynamic environment. With the integration of recreational and working zones, the overall work environment is diverse and holistic. Life should occur while working - GET UNBOXED ! Changing market dynamics lead to constant restructuring of the workforce. Flexible workspaces thus become crucial to account for all major downsizing and expansions required in the organization. Rapidly changing technology and infrastructure require regular up-gradations and lead to very high operational costs. Resource sharing allows superior infrastructure and technology at lower costs. Admin operations take up lot of valuable time and result in poor efficiency. Serviced workspaces remove this burden and frees up valuable time. Coworking offices provides a dynamic work environment. This results into a collaborative and vibrant community of creative individuals.